Well, the only excuse I have about this extremely late festive message is being too busy walking on the beach and swimming in the rock pool at Towradgi... what I wait for the whole year round, in France. Anyway, I thought this clever little Xmas wish, put together by my talented Triskele Books colleague, JJ Marsh too good not to share. The Third Path to Publication: Is it Right for You? Many thanks to Anne R. Allen for inviting me to her blog to talk about the Author Collective and its place in today's publishing world. Our Triskele Books handy list of acronyms and abbreviations for the indie author. Many thanks to Yvonne from Fiction Books, for featuring Spirit of Lost Angels and Wolfsangel in Mailbox Monday! My Podcast of Wolfsangel is now live in the current issue of Words with Jam. Very happy to find that French readers relate to Spirit of Lost Angels too! 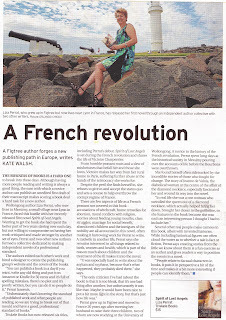 Here is my first French Review. Wolfsangel is December book of the month over at France Book Tours. There is also a giveaway to win a signed copy if anyone is interested. To curl up in a comfy armchair beside a crackling fire, hot chocolate and good book in hand. To escape the heat of the Southern Hemisphere in the shade of a eucalyptus tree, cool cocktail and good book in hand. To tear your hair out over Christmas gifts. for the Triskele Books CHRISTMAS PROMO! Many thanks to Stacey Mitchell for her interview and review on her blog. Thanks to Naomi of the Sisterhood of the Traveling Book Goodreads group for her feature on my books today. Back home from a fabulous, exciting and exhausting weekend for the launch of the 3 latest Triskele Books releases. Wolfsangel is finally out on its lonesome in the big wide world! Read all about the fun at Chorleywood Literary Festival here. Many thanks to Jo Barton (and Jaffa!) for her lovely interview, review and giveaway of Wolfsangel, on her blog. Join Triskele Books this week for the Prism Book Tours Giveaway week. All the Triskele Books authors and books featured in this week-long giveaway event. Drop in to say hi somewhere along the road of my virtual book tour, with France Book Tours, from November 11th - 20th. Reviews and Giveaways abound! They believed there was a third way of publishing, somewhere over the rainbow. So they packed their books and set off to explore. This is what happened on the journey. The Triskele Trail is a true story. About a writers' collective who made some mistakes and some smart decisions; who discovered opportunities, found friends and dodged predators in the independent publishing jungle. Fourteen books later, here are the lessons we learned. This is not a How-To book. 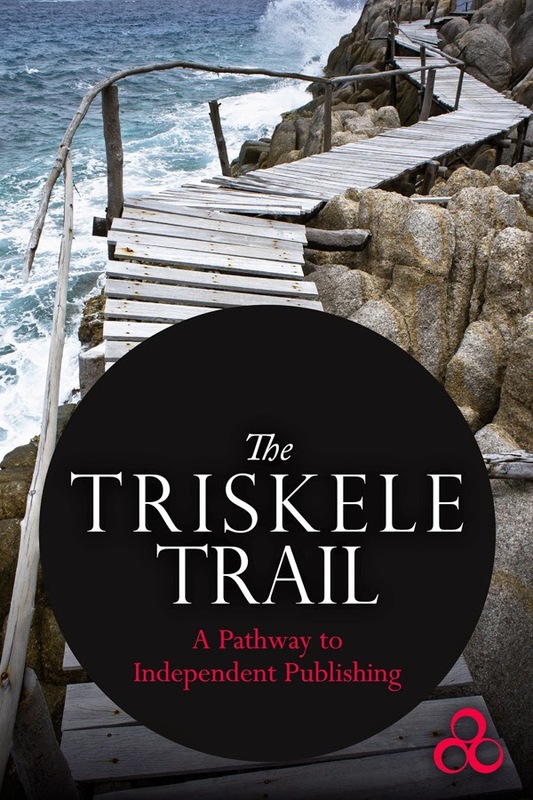 This is The Triskele Trail. The Affair of the Diamond Necklace. RIP Jeanne de Valois.... or not? Read my take on this enigmatic scandal that rocked France pre-revolution on the English Historical Fiction Authors blog. Friends, Family & Other Strangers From Downunder Free! Fancy Australian short stories? 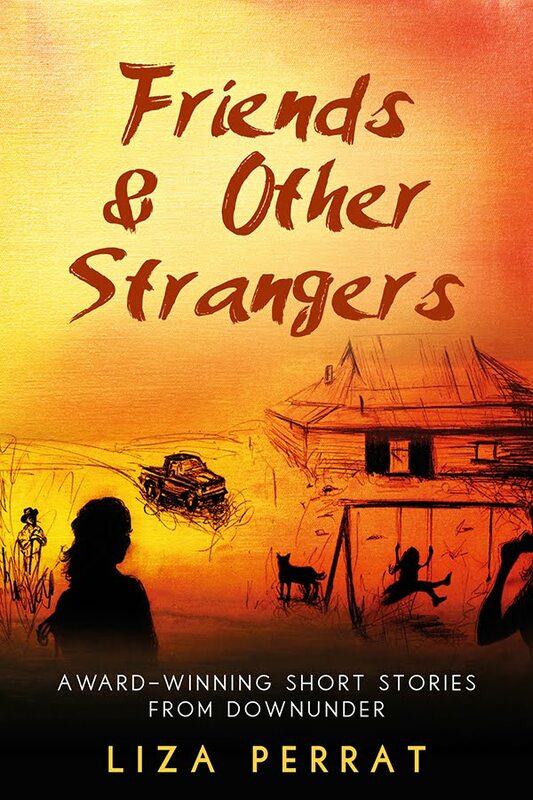 My collection, Friends, Family & Other Strangers From Downunder is free on Amazon from 8th - 12th November. If anybody is interested in winning a print copy of Wolfsangel, I am running a Goodreads giveway from 6th - 24th November. I'm pleased to announce the upcoming blog tour of Wolfsangel, with France Book Tours. In conjunction with the tour of Wolfsangel, listen to a Podcast excerpt of the book. Looking for a few tips on how to make Goodreads work best for you? Read my article here, on the Triskele Books blog. 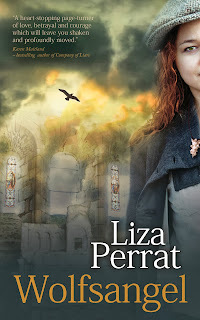 This week, the English Historical Fiction Authors blog is hosting a giveaway of Spirit of Lost Angels. 1 (international) paperback and 2 e-copies to be won! 3 gorgeous new covers. 3 fab new Triskele Books. Launch party November 16th, Chorleywood Literary Festival. Be there, or be .... somewhere else! The Triskele girls are very happy to announce that we will be appearing at the Chorleywood Literary Festival on Saturday November 16th, 2013. If anyone is planning on going to the festival, we'd love you to drop by and say hello! We'll be conducting The Human Library whereby participants can borrow one of the Triskele authors to discuss any aspect of indie publishing. And, The Rise of the Author Collective where we will talk about the lessons we've learned on the self-publishing journey and the benefits of working together. These events are Free, but ticketed. For more information, see Chorleywood Events. 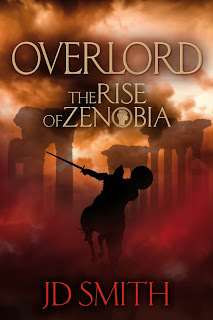 .... Cover reveal to follow! Many thanks to my Triskele Books colleague, JJ Marsh, for her interview in The Displaced Nation, on bringing location to life in fiction writing. Several months ago, I was nicely surprised when a fellow writer brought to my attention that Spirit of Lost Angels had been nominated for the EFestival of Words Independent Book Awards. 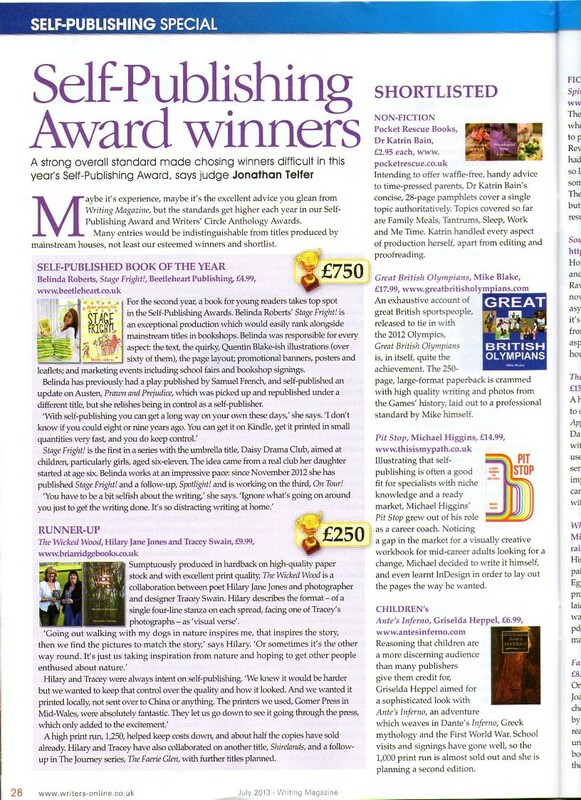 I eventually discovered it was a lovely book blogger/reviewer who nominated my novel (you know who you are!). Taking place over last weekend, the virtual festival was a fun event, with workshops, swag bags and lots of bookish discussions. 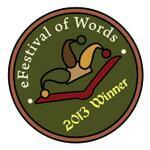 And I was very happy to learn that Spirit of Lost Angels won the Best Historical Fiction category. Many thanks to the organisers of the festival, and to those lovely supporters who voted for my book. In the second in our series of conversations with other author collectives, Triskele Books talks to Notting Hill Press on our blog. Want to know more about 16th century Tatars and Russians? Read my review of The Golden Lynx and interview with author, C.P. Lesley. Need any tips on self-publishing? Pop over to the Triskele Books blog and read our collection. JD Smith interviews me today, on the Triskele Books blog. 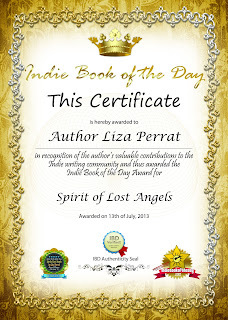 With thanks to Lisa Eileen Peters for featuring Spirit of Lost Angels on her blog. Very chuffed to see Spirit of Lost Angels highly recommended at the HNS 2013 conference in H.F. "Off the Beaten Path". The very-talented Jane Dixon-Smith, of JD Smith Design fame, and my fellow Triskele Books colleague, blogs this week about marketing options available to authors. Choosing well-presented, professionally-designed material can make your books stand out from the crowd. Check out Jane’s advice on this week’s Triskele blog. 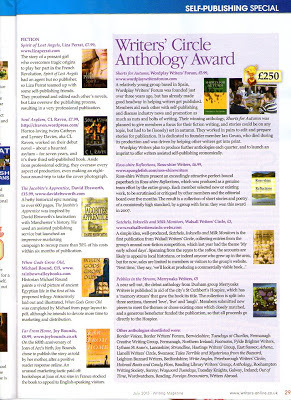 A lovely surprise to see Spirit of Lost Angels shortlisted in the Writing Magazine Self-Publishing Awards this year. Having trouble finding reviews for your indie book? Read my article on Indie-friendly book reviewers in this month's edition of Words with Jam. Just home after a fabulous, if not tiring, weekend in London for our second big Triskele Books launch at Foyles Bookstore in Charing Cross Road. It was great to meet my lovely fellow Writing Asylum writers in person. Thanks so much for your support everyone, and I hope you had a great time! Finally worked out that damn microphone! Many thanks to Lorraine Mace for her interview of me for The Writer's ABC Checklist. For each day of this week, starting 26th May, Laura from Colorimetry will interview a different Triskele Books author, who will offer a free e-copy of their book. And on Launch Day - June 1st - it's the Big Giveaway. All seven of the Triskele Books will be on offer for a signed paperback giveaway of whichever book(s) readers choose. 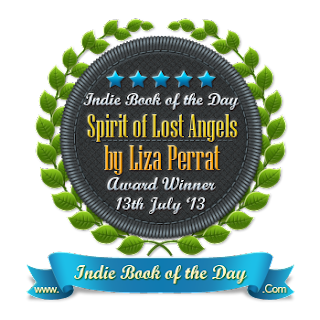 Many thanks to Audra of Unabridged Chick for her lovely review of Spirit of Lost Angels. Audra is also hosting a giveaway of one paperback and two e-copies. Enter the draw until 7th June, on her blog. What Sparks Ideas For Your Stories? I was very happy to learn Spirit of Lost Angels has been nominated in the Best Novel and Historical Fiction categories for the 2013 eFestival of Words Awards. 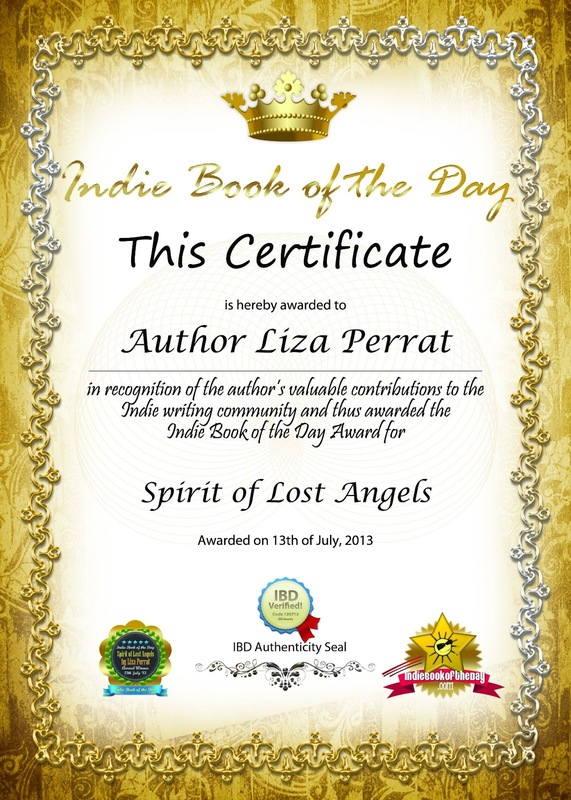 Firstly, I am so excited Spirit of Lost Angels will be featured as the Author group read for June, and I’m really looking forward to discussing the book with you. For members of the Goodreads Historical Fictionistas group, I am hosting a giveaway before the group read begins. The giveaway will start on May 1st and end on May 10th, to give the paperback copy time to arrive from France. One paperback copy will be available for international readers and two e-copies in whatever format is desired. 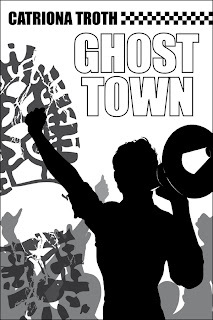 Please send me a message on Goodreads to enter and I will make up an anonymous draw. If you would like to listen to a Podcast of Spirit of Lost Angels. Reviews of Spirit of Lost Angels. Many thanks to all those members who choose to participate. Stunning covers from the talented JD Smith for the four new Triskele Books launch on June 1st. Gorgeous! Many thanks to Leah, of Uncorked Thoughts, for her lovely review of Spirit of Lost Angels. 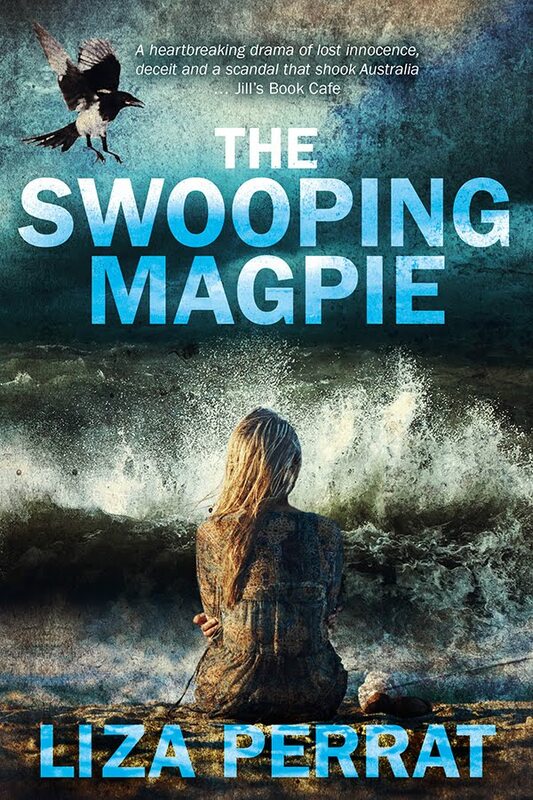 Enter Leah's giveaway, running for the next fortnight, to be in the running for a signed paperback or two e-copies of the novel. 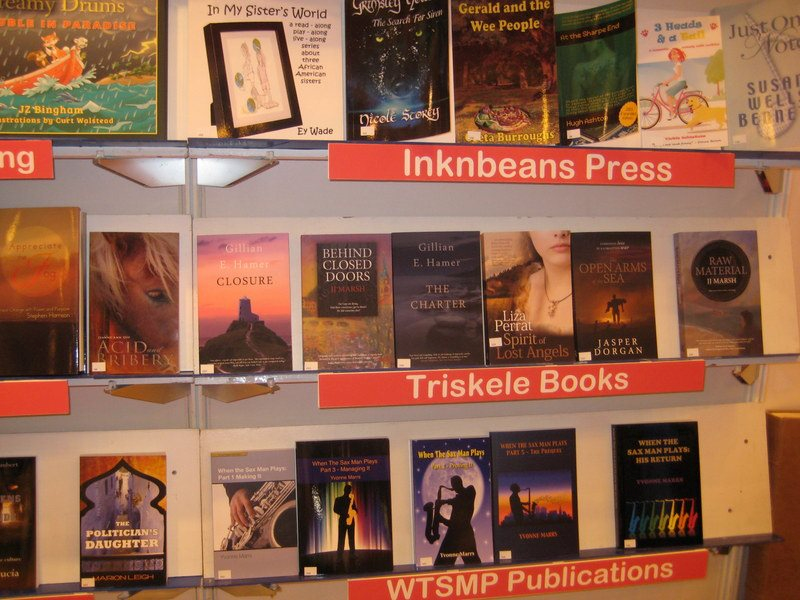 Read this article from my Triskele Books colleague, Catriona Troth, on how indie authors blew up a storm at this year's LBF. Last week, Laura from Colorimetry kindly hosted a giveaway for Spirit of Lost Angels. I'm pleased to say the giveaway was a great success and garnered many comments. In an effort to answer all the questions, I have posted a guest blog on Colorimetry. Yesterday I attended a webinar on Metadata, hosted by the Bookseller, in association with BIC (Book Industry Communication), sponsored by Virtusales. My Triskele Books colleague, JJ Marsh, beat me to a blog post, and explains it far better than I could. Anyone who has read and enjoyed Spirit of Lost Angels, I'd really appreciate your vote! Thanks in advance. Many thanks to Megan, of Reading in the Sunshine, for her lovely 5-star review of Spirit of Lost Angels. Thank you to Laura of Colimetry for interviewing me and for hosting an Easter giveaway of Spirit of Lost Angels. Read JJ Marsh's enlightening article on how best to present your manuscript on the Triskele Books blog. 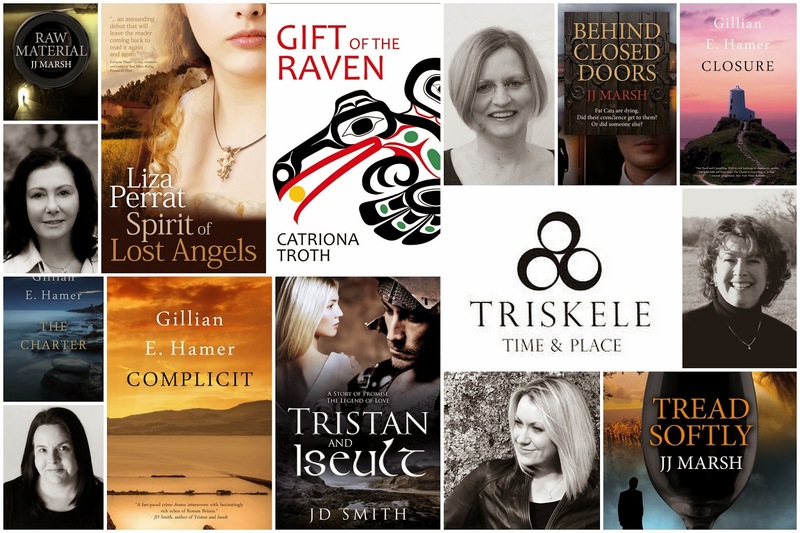 Join our Triskele Books blog conversation, where different indie authors recount their first year. Hop on over to Awesome Indies to read my post about how author collectives can help indie publishers. If you are an indie-published author and looking for the best way to get your book reviewed, read my post today on the Triskele Books Blog. How can a forensic expert benefit your writing? Read our latest post on the Triskele Books blog. 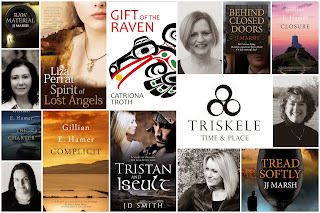 Today I'm blogging about researching historical fiction on the Triskele Books blog. 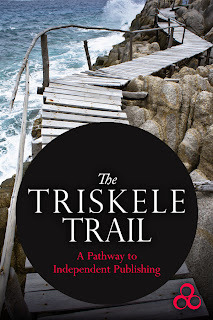 Announcing a new blog and a June 2013 launch for 4 more Triskele Books! 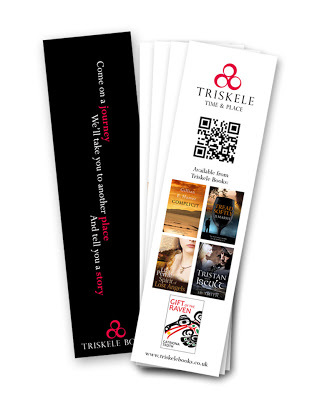 This week sees the launch of our Triskele Books blog. Jill Marsh opens with her words on what we've learned and the mistakes we've made during the first year of our authors' collective. Should I buy a lottery ticket? Just happened to see that Meg from A Bookish Affair has Spirit of Lost Angels on her list of good books for 2012. Thanks, Meg, I'm very chuffed! We are NOT getting another dog! Our beloved family pet, Oscar the border collie passed away last September. Oscar was lucky enough to grow up with three children, chasing balls and sticks, jumping on the trampoline with them, and instinctively trying to round them up when they got a bit too rowdy. They shoved him into princess and superman costumes, painted his toe-nails, plaited his fur and tied ribbons around his ears. He never once growled at them, and adored every minute of his busy life. Two of the children left our home in France to move to Australia last August, and, with the passing of Oscar, it truly felt like the end of an era. A week ago, some invisible force found us at the local animal shelter, a heart-wrenching experience in the best of times. A few hours later, we headed home with Holly, the dog we were never going to get. Meet Holly... she's a 9 month-old cross Labrador collie, and possibly something else - a crazy, exhausting, adorable, bundle of beans. I SAID NO DOGS ON THE BEDS! HOW'S A GIRL SUPPOSED TO WRITE, WITH THAT FACE AT THE WINDOW? Claire Whately's generous Goodreads review of Spirit of Lost Angels. A big thank you to Kate Policani of Compulsively Writing Reviews for her lovely review of Spirit of Lost Angels. Not quite rich and famous, but it's a start! 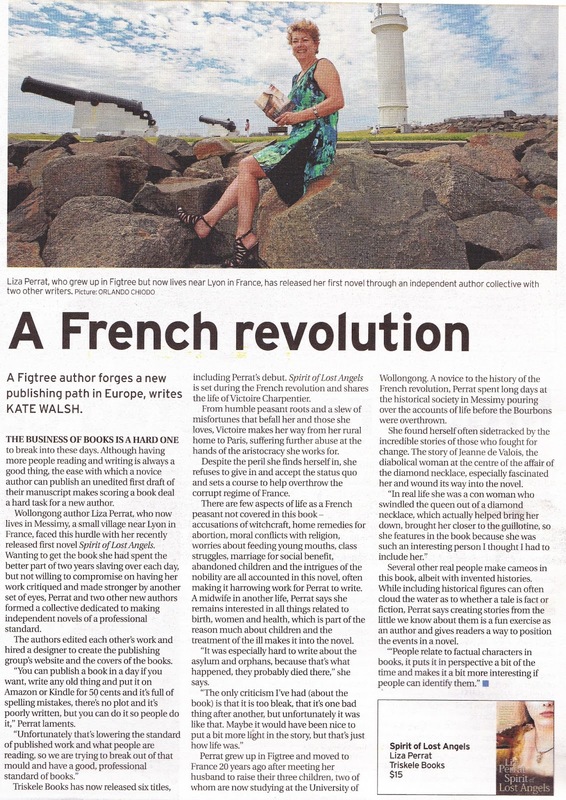 Thanks to journalist Kate Walsh for featuring a piece on Spirit of Lost Angels in Wollongong's local newspaper: The Illawarra Mercury. For those who were at the "photo shoot", there's a far more humorous story about clambering up those rocks in the high heels and short dress. Congratulations to Jill and Libby of Nuance Words for their success in The Independent Publishing Event in Zürich last weekend. Read all about it in this Takeway kindly provided by Nuance Words. Thank you to Ananda of Books To Remember for a wonderful review of Spirit of Lost Angels. Thanks to Melissa of Confessions of an Avid Reader for her insightful, detailed review of Spirit of Lost Angels. Where did the past seven weeks go? As my holiday in Australia comes to a close, and I try to accept returning to wintery, grey France, I thought I'd pen a few random thoughts and pics on my adored homeland. The scruffy man throwing a ball for his scruffy dog, a green parrot perched on a red and white checked tea towel draped over his shoulders. The fisherman standing for hours on the shoreline and never catching a thing, his wife reading her Kindle under the parasol. The army of dog-walkers on the dog-friendly part of the beach, the smiley mutts speeding along the sand after balls, breakers dumping them onto the shore. Mums jogging behind 4x4 wheel strollers. Pelicans perched on the lampost by Towradgi pool crapping on my book, my thongs and my towel! And more... so much more. If only it would never end, but my cat, and my third novel, beckon from across the wings of Cathay Pacific.